Killed in Action, 11th May 1918, age 19. Stuart (Stewart) Hawkins was the son of Beatrice Hawkins of The Drift, Prestatyn, and the late Henry Hawkins. He was born at Stroud, Gloucestershire. Ancestry records show his birth in the 4th quarter of 1898, and the parish registers show that Stuart Arthur Skelton Hawkins was baptised at Stroud parish church on 20th November that year. His father’s name was Henry James Hawkins, a printer, of Bisley Road, and his mother was Beatrice. Sadly, about one year later, death records show the death of Henry James Hawkins at Stroud (OND 1899). He was 22 years old. In the 1901 census for England, at Stroud, Stuart and his mother are found at Chapel Street, living with his grandparents. Head of the family was Oliver Skelton, a tailor, who was 63 years old. His wife Mary was 63, and son Thomas, a clothing salesman, was 35. His daughter, named as just Mrs Hawkins, was 22 and a widow. There were two other daughters, Marian 16, and Isobel who was 14. Stuart Hawkins, grandson, is 2, and another grandson, Harry, is 11 months old. Harry must have been born after his father’s death (AMJ 1900). Everyone had been born at Stroud. Sadly, Harry’s death is recorded in the last quarter of 1905, age 5. In the 1911 Census for Wales, Stuart and his mother are living at The Lilacs, Nant Hall Road, Prestatyn. The head of the household is Ella Cunnah, age 52, a widow of private means. Beatrice Louise Hawkins, age 32 and a widow, is described as a visitor and companion. However, in another column, she is described as a worker, so she is employed. Stuart A S Hawkins is 12, and at school. WB Buckley, (Bank), and Stuart Hawkins, (National Schools), went up for training on Thursday. They belong to the class of young men who are now being called up, and are glad to have congenial companionship in beginning their military career. We hope and expect that the War will be over ere their training is finished – or perhaps they will be ready in time for the triumphal march to Berlin! It seems likely that Stuart was a pupil teacher. However, the optimism shown in the newspaper was not to be realised. We are informed in the same paper on August 4th 1917 that “Stewart Hawkins (Welsh)” has been home on leave. Notification was received on Wednesday by Mrs Hawkins of The Beeches, that her only son has been killed in action on the 11th inst. Private Stuart Hawkins has been in France since October last. He was only a little over 19. Stuart’s service records have not survived, but we learn from the website Soldiers who Died in the Great War that he enlisted at Wrexham. From the Service Medals and Award Rolls site, we know that he had been with both the 10th and 11th South Wales Borderers at the Infantry Base Depot before going to France. The 10th (service) battalion was a battalion of the New Army, formed at Brecon in 1914 by the Welsh National executive committee. They landed at Le Havre on 4th December 1915. The 10th and 11th battalions served with the 38th (Welsh) division in France from the end of 1915 until the end of the war. In the Great War Forum there is an entry stating that in April 1918 the 10th South Wales Borderers moved south to the Somme following the German March offensive, Operation Michael, and after an action at Bouzincourt Ridge, above Albert, the 38th Welsh Division settled down in that area until August. It was during this time that our soldier was killed. 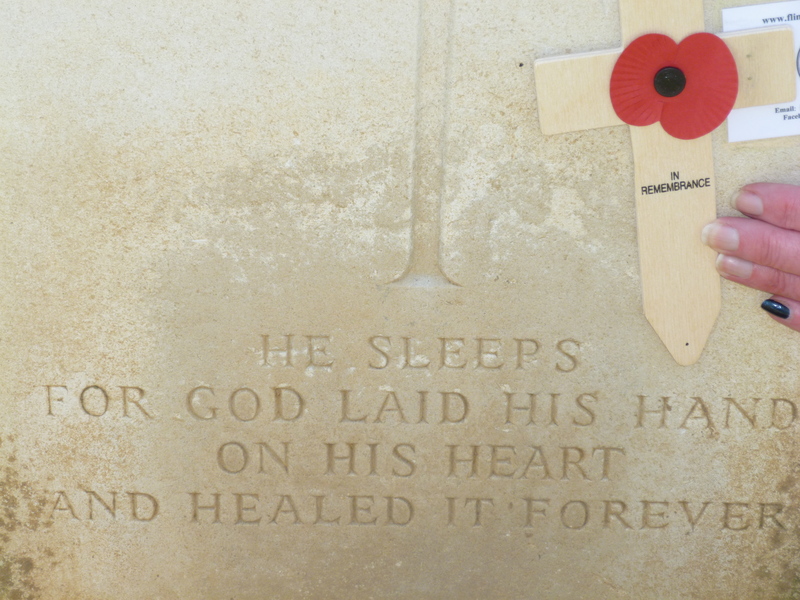 He is buried in the Bouzincourt Communal Cemetery Extension. Bouzincourt village is 3 km north- west of Albert, and was used as a field ambulance station from early 1916 to February 1917 when it was in the front line. A road outside the village is still called Chemin des Anglais (Road of the English), which was built by the British to keep moving troops out of sight of German artillery. The rebuilt church in the village is shaped like an artillery shell, and beneath the church is an old complex of tunnels which was used as a shelter by British troops. 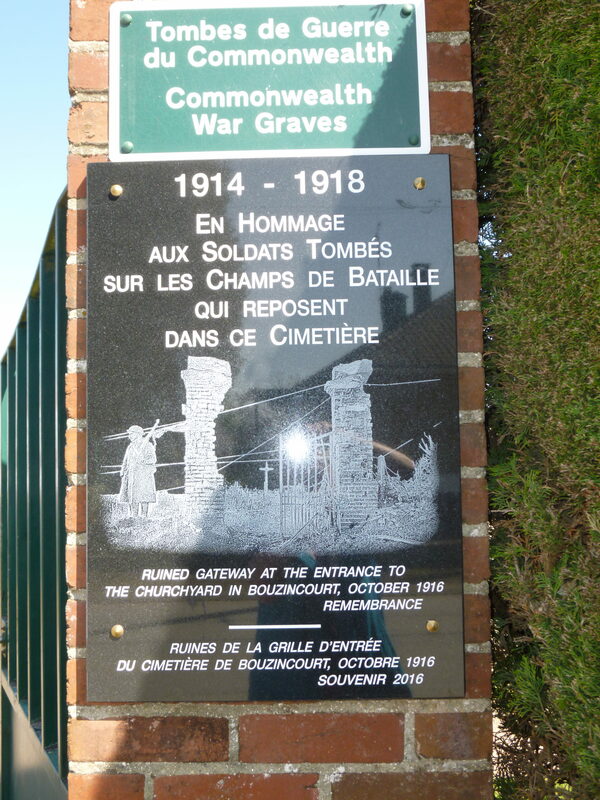 The Cemetery Extension adjoins the original Bouzincourt Community Cemetery. It was used for burials from the field ambulance, but also for many killed in the line. The extension was re-opened from March 1918, and was used largely by the 38th (Welsh) division. There was another tribute to Stuart from Mr W. A. Lewis the headmaster of Rhyl County School, telling his mother that he hoped it would be some consolation to her that her son had nobly done his duty, and that he had cheerfully sacrificed everything for this. He goes on to say how distressed the boys and girls of the 4th and 6th forms are at the sad news. From the website Register of Soldier’s Effects, which lists the monies owed to deceased soldiers, we see that his mother Beatrice, the sole legatee, received £10 1s 9d on 26th November 1918, and a further war gratuity of £4 10s on 23rd September 1919. There is a card for Stuart in the Roll of Honour at the Hawarden archives. It states that that his period of service was 15 months. It was signed by his mother, Beatrice Hawkins, on 2nd October 1919. Stuart had been her only surviving child. Mrs Beatrice Hawkins died at Prestatyn in March 1936, age 56.